Simon McKeon – Australian of the Year and executive chairman in Victoria of Macquarie Group - has critiqued the Occupy movement in an article in today’s Age. Simon McKeon – Australian of the Year and executive chairman in Victoria of Macquarie Group has critiqued the Occupy movement in an article in today’s Age. Today the police moved to evict protesters from Occupy Brisbane. Meanwhile in London, the Corporation of London and the St Paul’s Cathedral has halted moves to evict protesters that are occupying the land around the Cathedral in central London. When announcing the decision St Paul’s made reference to the group’s social justice aims and said those aims aligned with that of the Church. A spokesman for St Paul’s said the governing chapter had decided to cease legal action and instead engage with activists within the camp of 200 or so tents, which was set up on the western edge of the cathedral 18 days ago. “The alarm bells are ringing all over the world. St Paul’s has now heard that call,” said the Bishop of London, Richard Chartres. According to a report in the Guardian, the statement also announced plans for a new group, headed by Ken Costa, a former top investment banker, with the aim of “reconnecting the financial with the ethical”. 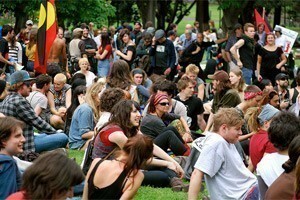 Simon McKeon believes that while the protesters have widespread public support – they are on “borrowed times” when it comes to occupying public space. McKeon will be answering questions on this issue on Fairfax sites from midday today for an hour.